Continuing our tour of Scottish pantomimes and in the second of our series of pantomime specials we were delighted to catch up with Kim Shepherd who will be returning to Musselburgh this festive season starring in The Brunton’s production of Sleeping Beauty. After the success of Puss in Boots last year, are you excited to be returning to the Brunton this Christmas? Definitely, I’m really looking forward to it! I had an absolute ball last year. It’s such a friendly theatre with a great core audience who love coming to see the panto. They’re all so warm and responsive and bring such a great energy. When the school groups come to see the show all the kids sing along and send in lovely letters and drawings. It’s so nice to walk on stage and there already be a buzz in the room because they’re all waiting eagerly to be whisked along through the story with you. I remember going to see them as a kid. I’ve always enjoyed going to the theatre. I think performing is something I was always going to have a go at! But there was something special about going to the Panto in my hometown of Dunfermline or heading over to Edinburgh to see one of the bigger ones that seemed to gear myself and my family up for Christmas. I used to get so excited, admire the talented casts, laugh hysterically at the slapstick humour (and as I grew up, at the jokes the dame would crack) and dream that one day I would get to pretend to be a princess and (hopefully) inspire young theatre goers the way I was inspired. Our writer, Philip Meeks writes such good female characters too. They’re the type of females who aren’t afraid to roll their sleeves up and get stuck in, which is great fun to play and great for the younger audience members to see! Girl power! It’s the fact that many families still come along as part of their festive season traditions. They leave all the stresses of Christmas behind and step into a fairytale world with us. We all share the story, the jokes, the songs and most importantly the laughs. Everyone likes to laugh, it brings people together. 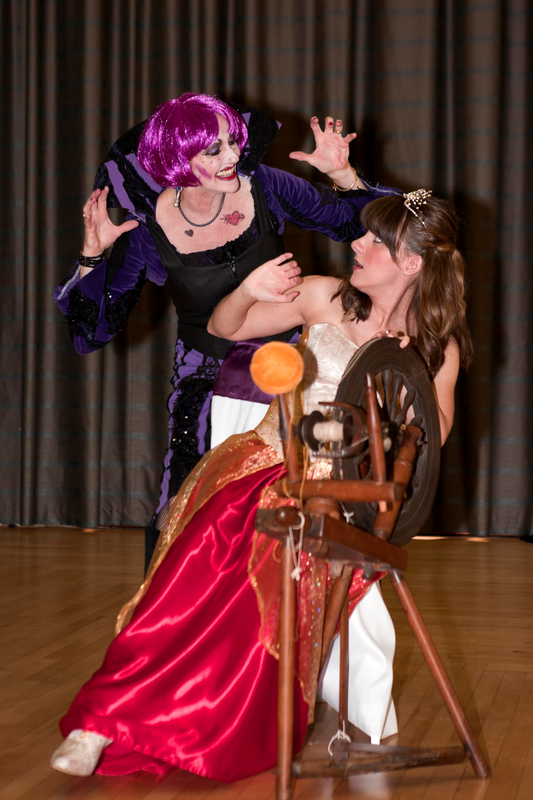 Panto seasons are always full on, what’s the biggest challenge and how do you keep your energy levels up? I don’t think the biggest challenge actually involves the show itself, it can just be a bit difficult to find time to get yourself organised for Christmas! Lots of card writing and present shopping/wrapping goes on between shows! I’m not complaining though, I’m lucky to be involved in a panto so I enjoy pretty much all of it! I can think of much more difficult jobs to have at that time of year. I think we might be one of the longest running pantos each year, so you really have to prepare yourself for a good wee while before starting rehearsals. I’ve had my flu jag, am taking vitamins, drinking plenty water and trying to get as much rest as I can so I’m starting rehearsals as fresh as possible. I try to exercise regularly to keep my fitness levels up, especially for the early morning shows! My voice is a huge part of my making a living so I’m really careful with it. I have a special steamer I use to steam my voice, and again, I drink lots of water and I try not to overuse it when I don’t have to. Plenty sleep and no going crazy with nights out. It sounds boring but I have a responsibility to my colleagues and the people who buy tickets to be as good as I can be. The method seems to have worked in the past, so fingers crossed it doesn’t let me down! The local kids who take part in the show are just brilliant. They’re all at school and doing the show at the same time, I don’t know how they do it! What are you looking forward to the most about another festive season at the Brunton? The people. The staff at the theatre, the crew, the cast and the audience. We had a great group last year and we’ve got a lovely, fun, talented group this year too. Everyone gets along, supports each other and enjoys being a part of it. That’s so important because you live and work in each other’s pockets for 2 months so it certainly helps when you all get along. Naturally, I’m looking forward to the dresses and shoes too! What 3 words best describe Sleeping Beauty? For tickets and information about Sleeping Beauty visit the Brunton's website or you can book tickets by calling 0131 665 2240. Sleeping Beauty is on from 26th November 2013 - 4th January 2014.